My nephew, Christopher, now lives in Texas. (If you are new to this blog, I tutored Christopher for the past 2 years. He’s a moderate functioning kiddo on the autism spectrum.) His new teacher seems really nice but has limited control over the classroom. For kids on the spectrum, weak classroom management can be devastating. In Christopher’s case, he relies heavily upon a well-structured class with clear boundaries. Despite acting up significantly at home, Christopher is adamant that he will not tantrum at school. My fear is that he will start to copy his classmates. They may easily recover with a structured classroom, but my nephew can get stuck in a cycle of misbehavior. At first, he thought it was slightly amusing that the teacher had numerous “talks” with kiddos, mostly because it wasn’t him. Now he is struggling with the stress of misbehaving kids and probably the temptation to act up himself. My contact with Christopher has been sporadic since school started. We use Google hangouts but the time difference is challenging. Most likely he needs a different classroom, but I’m trying to address the issues for him the best I can. I’ve decided to write a series about “Bryan,” a composite identity with plenty of similarities to my nephew. It’s in a Google doc so he can listen to it being read to him. (I noted in an earlier post that Christopher’s comprehension is improved when he can both listen and see the words.) I think the content will grab his attention and I have added some questions to which I can refer when we tutor online. Eventually I will use social stories to support Christopher, but given the stress of his move, I prefer to approach this laterally for now. In my email with the story attached, I will tell Christopher that I know about a kiddo who dealt with ta similar problematic classroom. (That is true, sadly.) The “Bryan” stories will allow my nephew to evaluate the problem from a safe distance but close enough to make personal connections. Christopher is sensitive to correction but wants to follow school rules, so I am hopeful this approach will help. If you’d like to access the entire story, here’s a link. Cee’s Fun Foto Challenge this week requires that that the photo topic have two E‘s in the word. I chose this sheet of foam, which is one-half of the base for the current Wonder League mission, a programming challenge for kiddos. I repeated the harrowing drive with a second sheet hanging out the back of my car. As I am wont to do, I somehow misread the required dimensions of the base and asked my dearest widower to chop off a foot. Not his own, mind you. The foam base is now 5 x 7, instead of the required 5 x 8. Oh dear. Here’s the almost-final product featuring Dash the robot. I am going to glue that extra foot back on (yikes!) and finish a vinyl mat that goes on top. Then all of this sits on two tables raised up to my disabled student’s eye level. Whew! That’s a mouthful and you are probably WONDERING what this is all about. The Wonder Leagues offers a terrific opportunity for kids to explore coding on a very cool mission in outer space. Yeah, that will take some explaining. More later. Bad Things have been happening outside. I am losing the battle. First, the deer continue to use our yard as a feeding and parking station. They leave raisins to mark their path up the driveway. You might wonder why the driveway looks so, um, marbled. (Trust me, this is relevant.) It’s because my dearest widower asked the pressure washer guys to remove the mulch stains. Remember I tossed hundreds of pounds of mulch into our “natural area?” Well, it might have improved the appearance of that natural area for a day or so, but it also triggered a vole invasion. What’s not to love in soft, moist mulch? So, the voles. They have ruined one-third of our front yard, as of today. Tomorrow- one half? Everyday, there are new raised tunnels and piles of soil. I bought these pellets that supposedly irritate their sinuses, but I feel too discouraged to use the stuff. Plus, I have an aversion to watering (see below), which is necessary to activate the pellets. Voles are quite admirable diggers, I have to admit. You wouldn’t believe the amount of soil they’ve rumbled through. As if voles weren’t bad enough, AT&T has been supposedly laying a new cable in the back yard. All I can see is spray paint, wires, and more tunnels. Perhaps AT&T hires voles. I have a work crew ready and willing in the front yard, if need be. The beautiful meadow sage, which is deer resistant, has not withstood the heat and relative drought. Yes, I should have watered them, but the bloody mosquitoes attack me through my shirt and hair as soon as I step outside. Vance, the Venus Flytrap, has given up the ghost. I did accidentally spray him with insect repellent as I was venturing out, so that didn’t help. The bug spray didn’t help me either, for that matter. Overall, I’d say I’m a bit discouraged in my attempts to fashion a lawn. No one else on our street has voles (I’ve looked). Other folks sit outside in chairs without mosquito netting and clouds of repellent. At least the deer are equal opportunity invaders. Go deer! Please. I always look forward to Cee’s Share Your World blogging challenge. Sadly, I’ve been an erratic blogger for a while…. OK, I will put that behind me and wordpress on! I want to learn more about… so many things! I love information of all sorts, which is why I am enjoying the Skelgill detective series so much. It’s also why I love teaching; the field of research keeps expanding and instruction becomes integrally tied to what we know about neuroscience. On a vacation, what you would require in any place that you sleep? No roaches! We spent a week at a beach resort years ago and as we were getting ready for bed, I saw this GIGANTIC roach on the wall above the bed. My dearest widower mounted an energetic but futile attack. (Did you know they can flip upside down and hang onto ledges like acrobats?) My widower assured me it was gone for good but I whined, “What if it comes back and gets on my face?” Once I had settled down, we fell asleep. I awoke to a gentle touch of something crawling across my lips! As it moved up my forehead, I shrieked and jumped up and down on the bed, trying to knock it off me. My dearest widower quickly mounted a renewed assault and the bloody roach was smashed. I can still feel it on my lips. Such trauma! What is your greatest extravagance? Oh, that’s easy! Yesterday I ate an entire giant Caramello bar in less than 5 minutes. Yum! What inspired you this past week? Feel free to use a quote, a photo, a story, or even a combination. I teach a medically fragile student who endures more than any of us could possibly imagine. (I do plan to share a LOT more about him pretty soon.) This kiddo is courageous, determined, and gifted. He can hardly speak, can’t use his limbs, and has multiple disorders. I am inspired by his incredible effort, his empathy for others, and his wild sense of humor. I am blessed to teach this youngster! His family enjoyed a Hard Hat Day as we worked on “construction” at Camp Wonderopolis! What a precious heart Michelle has! How encouraging- and what great advice! Good morning, friends! Welcome to the work week and another day that the Lord has made. Today I woke up thinking about all of you and what I would share. Typically, I schedule posts in advance, but last night I had a few people on my mind and in my heart, so I did what I vowed I would always do when that happens — pray. I promised myself that I would pray for anyone who crossed my mind in that moment. Most people probably call or text whenever they think of someone they love, but I stop to pray. One day I hope to do both; but for now, I’ll simply pray. It’s not what you think! I’m innocent! Murder in School is the second in a fantastic detective series by Bruce Beckham. DI Daniel Skelgill is the unlikely name of the Cumbrian Detective who reminds me very much of Sherlock Holmes. Skelgill is simply brilliant, and of course, totally eccentric He doesn’t much care about social skills but inspires fierce loyalty in his two assistants, DS Jones and Leyton. Skelgill has an insatiable appetite for bacon biscuits and tea, often at Leyton’s expense. He is an avid fisherman, solid bowler (in cricket), and expert climber/rescuer of the Lake District. Skelgill is often acerbic and swings wildly between humility and pride. He’s one of those men who seems old before his time, perhaps because of his expert knowledge- or is it because he is rather set in his ways? Murder in School showcases Skelgill’s oblique but intuitive approach to solving mysteries. He is called upon to investigate the apparent suicide of a master at Oakthwaite School, which is followed by yet another suicide, with no shortage of possible suspects. The situation worsens when the Chief’s son disappears and a hooded figure reveals a century-old cabal. We watch Skelgill, such a humorous and sneaky bugger, reconnoiter crime scenes, scarf scones, and race the clock to rescue that poor student. I greatly admire the writer, Bruce Beckham, who not only brings the Fells to life, but animates this page-turner with clever characters, wry humor, and an ending that defied my imagination. What are some of Seesaw’s best features? It’s teacher friendly, supports simple yet effective digital learning, enables teachers to individualize within a large group setting, and is FREE! Seesaw allows teachers to connect with families effortlessly (and privately, if needed). Best of all, from a special ed perspective, it supports struggling learners by providing a wide range of response choices without time pressure. Teachers can create formative assessments, announcements, videos, and much more to share with individuals or the entire class. Teachers also adjust settings to approve all entries before they are posted, message families privately, and moderate a class blog. Seesaw is student friendly, working well whether each student has a device or shares one. All students access a private “journal” where they can post photos, videos, links, files, and drawings. All videos and photos can be edited to include recordings, text, and drawings. This app allows special needs kids alternative responses to a range of typical school tasks. The drawing feature, a miniature whiteboard, could improve student understanding in math by allowing teachers quick access to how a problem is interpreted and solved. The recording feature allows shy or socially awkward kiddos a less stressful approach for class presentations. For those students who need extra time to process information, Seesaw can be used flexibly to provide adequate thinking and prep time. Before you start Seesaw, it’s wise to go through their online course which has been carefully designed to provide practice on each feature. Plus, you get a certificate of credit- how sweet! Seesaw works on laptops with Chrome or Firefox, Kindle Fire, Chromebooks, iPads, iPhones, and Android devices. And there are actually two Seesaw apps, Class and Family. Both are awesome! I give Seesaw a 5-star rating for its broad scope of use, ease of access, and potential benefits to special needs kids. 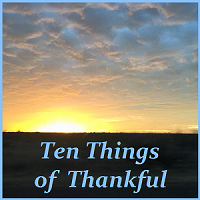 I decide to post my Ten Things of Thankful in photos this week. Thanks, Josie, for hosting this blogging challenge! “O, what tangled webs we mortals weave when first we practise to deceive!” I’m grateful to be hand-in-hand with a dear family who faces a spinning web of lies. My dear sister-in-law Eva Marie Everson, is an author and more! She took this photo and created WOW! A much-needed sign for Google hangouts when tutoring! What a miracle! A friend walked away from this. Her car was totalled…. Thankfully, no one on Pinterest will ever see this wonky Wonderopolis project! Thankfully, this is fiction. A review will follow! A student has worked hard at Camp Wonderopolis and enjoyed every minute of it! Had fun with a friend and her daughter. Just in case hurricane Irma takes aim at NC, our roof and underlying wood are now secure, thanks to some wonderful folks! Finally, how pleased I am to share this blurry photo of one of our “twins,” taken from my car, as this one and its partner rest in a neighbor’s yard- not ours!